This week thousands of school and college pupils from all over Northern Ireland and the border counties took the opportunity to sample student life at the University of Ulster. A series of Open Days allowed prospective students to meet staff and existing students and also to see first-hand the excellent courses and facilities available at Ulster's Coleraine, Jordanstown and Belfast campuses. Open Day at Ulster's Magee campus will take place on Saturday 21 September, 2013. During the events, attendees enjoyed the opportunity to meet with academic staff and discuss course options, hear talks and take tours of the campuses and University accommodation. Ulster has around 400 undergraduate courses to choose from in areas including, Art and Design, Arts, Built Environment, Business and Management, Computing, Engineering, Life and Health Sciences and Social Sciences. As well as sixth-form students and recent school leavers, the Open Days welcomed mature students, those coming to university with Access Diplomas and anyone thinking of enrolling on one of the 100 part-time courses on offer. Pauline Wylie, University of Ulster Marketing and Recruitment Manager said: “This year we’ve sought to make Ulster's Open Days as accessible as possible with events on Saturdays and an evening session at Jordanstown. University of Ulster Open Days, in partnership with Danske Bank, took place on: Saturday 7 September 2013 (Coleraine), Tuesday 10, Wednesday 11 and Thursday 12 September (Jordanstown). 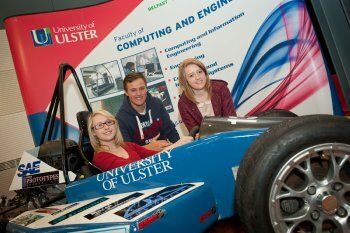 Coleraine triplets Eleanor, Katie & Matthew Heath enjoying Open Day at Ulster's Coleraine campus.